The pressure of meeting quota or needed income has many overlooking the better solution. Similar to the proverbial ‘rush to judgment,’ we experience a ‘rush to sell.’ Being on the buying end becomes highly annoying plus raises doubt and fear for working with the seller. Finding the better solution should apply to all professions and endeavors. Invariably people believe that taking shortcuts is okay. When pressure is applied for representatives to make their monthly numbers, concern for the client sits in last place. For example, most doctors are held in high regard, but some will push medication as a cure-all. They omit figuring out the ‘why’ the problem exists. We need to research sites such as WebMD ahead of time to have concrete talking points in mind. There have been occasions where it felt as if the doctor was on commission from the pharmaceutical company. Credibility and trust determine the viability of the sale. Personal development and continuing education are a forever requirement in the business world. But the classic sales books provide sage advice. SPIN Selling by Neil Rackham guides readers through the questions to be asked before asking for the sale. It’s always wise to think about previous sales, both those that went well and the ones that crumbled piece by piece. Similar to finding the better solution for clients, it’s smart to do the same for yourself. Honestly reviewing all the parts of several sales gone wrong will help identify why it happened. For more insight read Do You Reflect On the Past to Improve the Future? Sometimes poor habits get in the way. Observe colleagues and competitors for how they perform. What are the more successful doing differently? While you don’t want to change your unique style, you do want to recognize what you may be missing. Other times, pressure and demands by management leave little room for sound judgment. Should this be the case, make it a priority to muster up the courage to question those demands. Asking questions such as ‘why,’ ‘what if,’ and ‘have you considered…?’ might help turn things in the better direction. If you don’t believe it, you will have difficulty selling it. One of the better strategies is to ask for suggestions to improve from your clients. Some will indicate everything is perfect while others will offer insightful help. When uncertainty hits as to how to proceed with a delicate matter, ask your trusted peers. 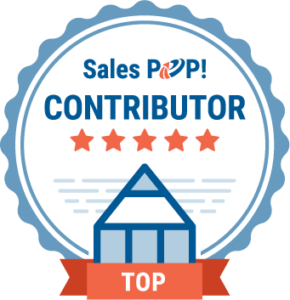 The combination of striving to improve every day, plus asking for input from peers and clients will have you set the bar higher for selling more.